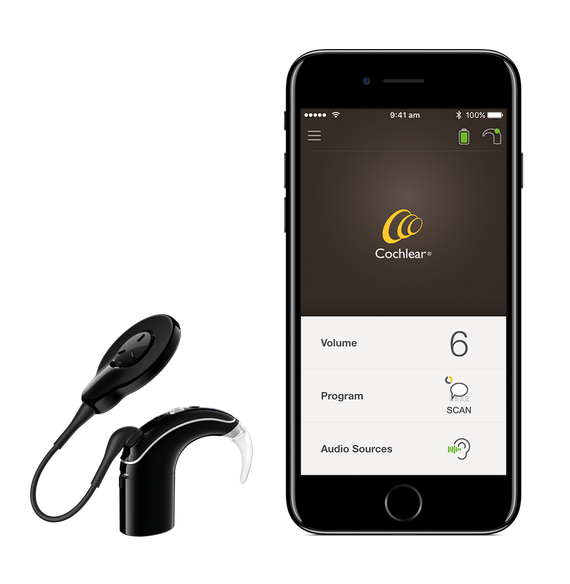 Cochlear Limited, the global leader in implantable hearing solutions, announces the upcoming release of the Nucleus® Smart App for Android™ in the United States and Canada, offering greater connectivity than ever before for people with hearing loss and a cochlear implant. Cochlear implant recipients with the Nucleus® 7 Sound Processor can now control their hearing with the Nucleus Smart App from a compatible Android device, allowing them to monitor and adjust their settings, view personalized hearing information and even locate a missing sound processor, all from the convenience of their smartphone. Since the Nucleus 7 Sound Processor was first launched in 2017 as the world’s first Made for iPhone cochlear implant sound processor, Cochlear has been working to extend the benefits of its industry-leading technology to Android smartphone users. Along with the release of the Nucleus Smart App for Android, Cochlear has also added a first-of-its-kind control feature called ForwardFocus available to compatible smartphone users of the app. The user-activated control feature allows the wearer to hear better in a challenging listening environment such as a noisy restaurant. When switched on, the ForwardFocus feature reduces distracting noise coming from behind a person so they can more easily enjoy a face-to-face conversation. The Nucleus Smart App, which is exclusively compatible with the Nucleus 7 Sound Processor, offers a range of first-of-its-kind features for users. From locating a lost or misplaced sound processor using the Find My Processor feature, to confidently tracking progress with the Hearing Tracker feature, or reducing noise from behind with the ForwardFocus feature, users can experience unprecedented connectivity and performance in managing their hearing. More on the hearing devices market in the U.S. can be found in a series of reports published by iData entitled the U.S. Market Report Suite for Hearing Devices. This report covers the following market segments: traditional hearing aids, bone-anchored hearing aids, cochlear implants, middle ear implants, otoacoustic emission (OAE) analyzers, auditory brainstem response (ABR) analyzers, audiometers, tympanometers, real ear analyzers, otoscopes and personal sounds amplification products (PSAPs). The iData series on the market for hearing devices covers the U.S. and 15 countries in Europe including Germany, France, the United Kingdom (U.K.), Italy, Spain, Benelux (Belgium, Netherlands and Luxemburg), Scandinavia (Finland, Denmark, Sweden and Norway), Portugal, Austria and Switzerland. Reports provide a comprehensive analysis including units sold, procedure numbers, market value, forecasts, as well as detailed competitive market shares and analysis of major players’ success strategies in each market and segment. To find out more about hearing device market data or procedure data, register online or email us at [email protected] for an U.S. Market Report Suite for Hearing Devices brochure and synopsis.